Click the headline to read a well thought through review of Houdini's 1922 silent film The Man From Beyond at Psychobable ("A Freaky Forum for Groovy Ghouls and Retro Rock"). Warning, tangent ahead: This review just reinforces my frustration that The Grim Game is still not available, even though a print exists. Many people now sample Houdini's film work (which is more accessible than ever), but all come away disappointed and a bit perplexed that a Houdini movie doesn't feature a series of spectacular Houdini escapes. Of course, that's exactly what The Grim Game offers. It's a great disservice to Houdini's legacy that his best and most representative film is not available to the public for reasons I don't understand. There has to be a good reason why we haven’t seen the Grim Game, yet. But like you John, I just don’t know what that is. 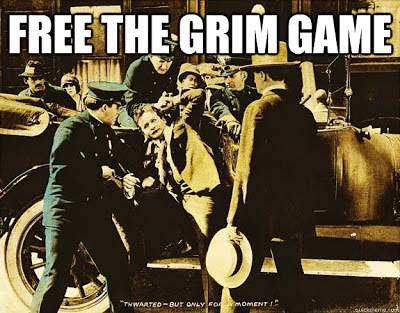 We can only hope that we are: “Thwarted but only for a moment!” Free the Grim Game. I like that Free the Grim Game photo of a heavily made up Houdini. He looks like a kewpie doll. I think it's just a set of bad circumstances that puts The Grim Game out of reach. I'm sure a number of prints over the years were trashed because they were extremely flammable. Other prints deteriorated over time. The wrong people have custody of the one good print we know of. My grandparents had all the movie, the fire dept told to get rid of them back in the 1930. they where fire hazard. they live 67 payson ave.